Smartenit, Inc. , Internet of Things innovator, announces the addition of an energy metering in-wall smart electrical outlet to their lineup of home automation devices. The elegantly designed tamper-resistant socket offers consumers another option for monitoring, controlling and managing energy of lights and appliances. The ZBMSKT1 socket is a duplex receptacle that offers an always-on top outlet, and a bottom outlet that is fully manageable via ZigBee controllers. The controllable bottom outlet measures energy consumption and other load parameters, allowing users pinpoint control over their energy usage. By enabling complete removal of power to a connected device, it eliminates the wasted energy drawn by idle devices known as “vampire power”. Safety rated for a combined 15 Amps at 120 or 220 Volts AC, it is perfect for controlling lamps and medium size appliances. The outlet comes with a matching Decora faceplate for aesthetically pleasing installation. 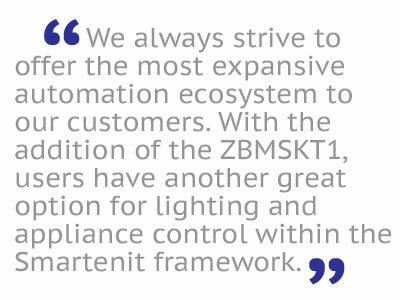 Communicating using ZigBee Pro, the ZBMSKT1 is compatible with any compliant ZigBee Home Automation (HA) applications or gateways including Smartenit’s own. Smartenit offers a FREE, complete and sophisticated application, iSmartenit – for mobile, browser, or desktop platforms, that fully supports the outlet. The App displays the outlet status and energy consumption data while giving the user direct control over the connected appliances. Smartenit’s powerful App Wizards logic engine lets the outlet influence or respond to the status of other devices in the network. Smartenit, Inc., a wholly-owned subsidiary of Compacta International, Ltd., is dedicated to delivering automation solutions that continually expand the Internet of Things. These solutions have applications in many areas including energy management, water management, monitoring, comfort, and lighting, in the modern home and beyond. Smartenit’s cost-effective, and easy-to-use products are part of an ever-expanding system that allows easy monitoring and management of any connected device from anywhere. For more information, visit https://smartenit.com. Find Smartenit on Facebook and follow us on Twitter @smartenit.